Looking after their bodies in the heat of battle might not be the first thing which comes to mind for elite level Premiership Rugby players – which is precisely where one Leamington GP’s care and expertise comes to the fore. 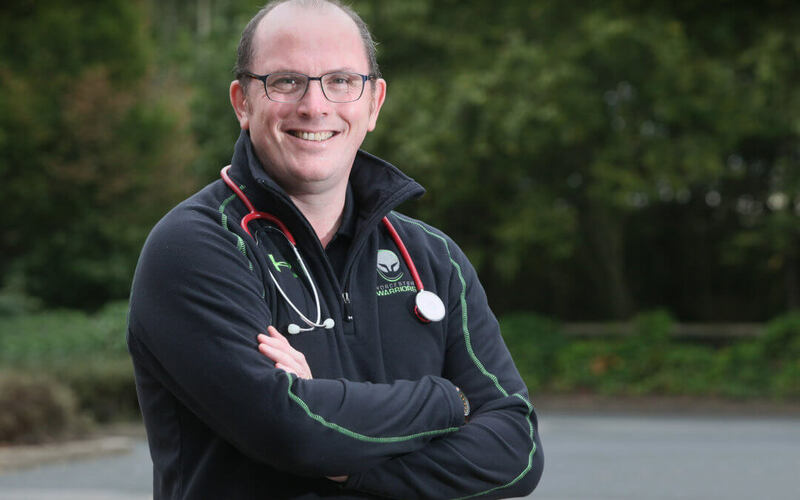 Dr Nick Tait has been promoted to lead doctor at Worcester Warriors RFC and is responsible for overseeing the medical welfare of the Aviva Premiership club’s First XV, academy and women’s teams. He has been a pitchside doctor for the club for 13 seasons and splits his working week between the Warriors, his NHS responsibilities and private doctors group TFJ Private GP Services, based at the Nuffield Hospital in Leamington. On an average First XV matchday for the Warriors, Dr Tait will arrive at the ground at 11.30am to start the pre-match preparations, ensuring the players are strapped up and ready to go. He will then spend the match on the sidelines, ready to be called into action to deal with any injury – particularly concussions, lacerations or dislocations, which are some of the most common injuries seen on a rugby field. There is a particular focus on the issue of concussion, in the wake of an increased awareness of the long-term effects of players suffering blows to the head and the need to ensure a player is fully recovered before returning to the field. Post-match, Dr Tait will ‘mop up’ where needed and provide medication for the walking wounded and will leave only when he is happy all the players are medically well. He’ll then return for an injury clinic the following day, organising scans where they are needed and dealing with any new issues which have arisen. “A matchday is all about knowing which players you can keep pushing to get them through and which ones need a rest,” said Dr Tait. “The forces their bodies are subject to on the pitch can be extreme. On average, a full head-on frontal collision will send something like 8g to 10g through the body – the force of gravity multiplied eight or 10 times every time they go in for a tackle. Addressing the issue of concussion, Dr Tait added: “There have been concussion rules in place for many years but, historically, they haven’t been managed properly and players have returned to play before they were ready. “Second injury syndrome is a serious problem. More often than not, you can’t avoid the first concussion – that’s part of the game and just bad luck. It’s second injury syndrome which you can avoid and that’s where the damage is done. It’s not just pitchside where Dr Tait’s expertise in the sports field is put to good effect – it’s in the classroom, too. He works as an instructor on the RFU’s Immediate Care in Sport course, a rugby union-specific training qualification for healthcare professionals working in sport. All medical professionals working in Premiership and Championship level rugby need to have the qualification, which has proved to be such a success it is now being taught overseas in Australia and Hong Kong. “People have died and do die on the pitch, which should never happen. Having people who know how to keep players safe is so important. This course is a real success story,” he said.